Ascension Providence is pleased to announce the Ascension Providence Robotic Surgery Institute, featuring the latest in advanced robotic surgeries. The da Vinci® Si™ Surgical System allows qualified surgeons to perform complex surgeries through tiny incisions with greater precision, vision and control. This may lead to significantly less pain, shorter hospital stays and faster return to normal daily activities – as well as the potential for better clinical outcomes. With the da Vinci Si Surgical System, surgeons and hospitals are rewriting accepted standards for surgical care. Da Vinci is changing the experience of surgery. Contact the Ascension Providence Robotic Surgery Institute at 254-751-4905 or email us. 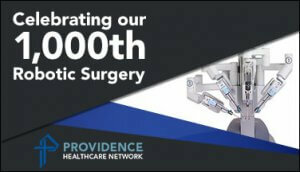 The talented surgeons, nurses, surgical technicians and the entire robotic surgery team of Ascension Providence have surpassed the 1,000 mark in surgeries utilizing the technology of the da Vinci® Si™ Surgical System. Robotic surgery typically means tinier incisions, greater precision, and much shorter recovery times. It’s the perfect teaming of man and machine. Ascension Medical Group Providence Women’s Health partners with the Ascension Providence Robotic Surgery Institute, offering gynecological robotic surgery including hysterectomy. Contact Waco Center for Women’s Health at 254-772-5454. Waco Surgical Group partners with the Ascension Providence Robotic Surgery Institute, offering gynecological robotic surgery including hysterectomy. Contact Waco Surgical Group at 254-776-3188 or visit wacosurgicalgroup.com. Ascension Medical Group Providence partners with the Ascension Providence Robotic Surgery Institute offering urological robotic surgery, including prostatectomy. Contact Central Texas Urology at 254-741-6113 or visit centraltexasurology.com. Surgical Associates, P.A. partners with the Ascension Providence Robotic Surgery Institute, offering robotic surgery, including single-site cholecystectomy. Contact Surgical Associates, P.A. at 254-752-2587 or email sassociates@hot.rr.com.